Welcome to my weekly series: Book Club Picks. This week, I'm sharing a slightly different list of books. Since it's summer, I thought it would be fun to share some children's books that would be good for a late-elementary or middle-school book club. Now, I know there are plenty of adult book clubs who would read middle-grade books as well. Mine actually chose one of the books on this list last year. So hopefully you'll find something you ~ or your kids ~ would like to discuss in a book group. Note about the links below: My reviews do not include spoilers, but the discussion guides do. The book covers are Amazon Affiliate links. If you use those links to make a purchase, I will receive a very small commission but your price will remain the same. This novel, about a Vietnamese girl who has to flee her home country during the Vietnam War and relocate to the United States, is written in verse. Book clubs can talk about the effects of the war on the people of Vietnam, the difficulties young immigrants face in acclimating to a new country, including bullying, and the unique writing style used in the book. Explore the U.S. Revolutionary War through the eyes of a young boy. This historical fiction novel follows one boy whose village is destroyed and parents taken while he's out hunting in the woods. Book clubs can talk about Samuel's struggles to survive and the horrors of the war. They can also learn more details about the Revolutionary War through short nonfiction pieces that are sprinkled throughout the novel. This novel is a great introduction to the dystopian fiction genre. Book clubs can talk about the pros and cons of the community Lowry creates, weighing individuality against protecting people from bad feelings and dangers. The importance of individuality and memories and feelings are all key themes in this novel, and will give groups plenty to talk about. This is one my favorite middle-grade novels. It revolves around the fact that there are places in the modern world without access to clean water. It also introduces the story of the "Lost Boys of Sudan" who were orphaned during the Second Sudanese Civil War. Book clubs can talk about the struggles people face with finding clean water and the hardships faced by children who are orphaned during war. What are your favorite middle-grade books? 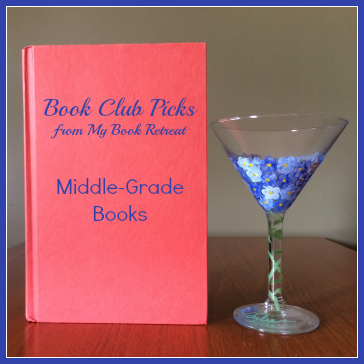 Does your book club read middle-grade and young-adult books? Next week, I'll be sharing some mysteries and thrillers that are fun to discuss with book clubs. Please let me know if you have suggestions for other topics to cover, or if you would like to write a guest post for my Book Club Picks series. I'd love to hear about your book club or your favorite books for discussion! Don't miss out on another edition of Book Club Picks. Subscribe to my weekly newsletter. I need to check those out. Thanks for the recommendations!